The games however did produce two lasting legacies – the unofficial theme song “Moscow” by the German disco band Dschinghis Khan, and the official Olympic mascot “Misha”, the bear cub (also known as “Mischka”). In Russian, ‘Misha’ and ‘Mischka’ are the diminutive forms of the Russian male name ‘Mikhail’, the equivalent of ‘Michael’ in English. The bear is also an animal that traditionally used to symbolise Russia and the Soviet Union, much like the Bald Eagle is used in the USA. Misha was designed by Victor Chizhnikov – a renowned Russian Children’s book illustrator. In 1977, the committee organizing the Olympics held a contest for the best illustration of a bear. 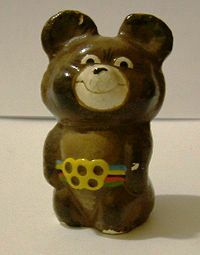 The judges chose Victor Chizhikov’s design depicting a smiling bear cub wearing a blue-black-yellow-green-red (colors of the Olympic rings) belt, with a golden buckle shaped like the five rings. Misha was confirmed as an official mascot on December 19th, 1977. Misha is the first mascot of a sporting event to achieve large-scale commercial success as merchandise. The Misha doll was used extensively during the opening and closing ceremonies, had a TV animated cartoon and appeared on several merchandise products. Misha also appeared in the 1980 Olympics episode of the Russian cartoon Nu, pogodi!, handing trophies to the Wolf and the Hare. Due to the success of Misha, sporting mascots have assumed a prominent role in all Olympic Games following 1980 and have even been introduced into other sporting competitions like the FIFA world cup. Here is a video excerpt from the 1980 Moscow Olympics closing ceremony showing a large inflatable Misha Bear being released into the sky. The music playing is “Goodbye, Moscow”, created by Nikolai Dobronravov and Aleksandra Pakhmutova.